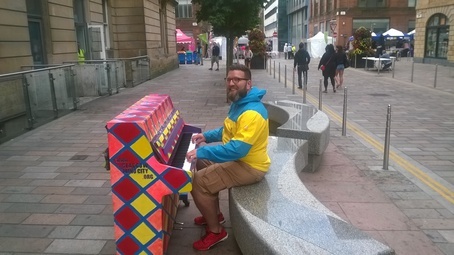 The Pop-up piano, which has been decorated by Tom Binns (Project Manager) and Big Red Hen, it traveled around Glasgow to various locations during the 2014 presentation. David Boyce on George Square . . . taking time-out from tuning pianos ! Luke on George Square . . . with another budding Liber-Archie in the background. Tam Dean Burn ( Singing & Making Faces ), Emma Schad ( Playing Flute ) and Andy Alston ( Playing ' Liber-Archie ' ) on the Booksonabike Marathon storytelling tour at Tramway. Alan Kenny playing ' Calisia ' down at Custom House Quay on Aug 3rd ~ just before the sun comes out. Cara and Amelié playing Liber-Archie on Hutcheson St on his whistle stop tour of the Merchant City Festival. Tam Dean Burn & Co being 'Handy' . . at Tramway, out in the cafe at the Hidden Gardens. Martin doing a bit of Elton's Your Song and finishing off with a boogie. Fabio Tedde . 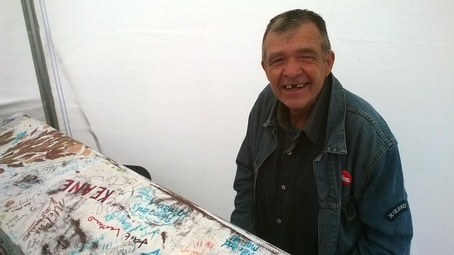 . . well traveled and now in George Square playing the Galgael piano. Jack playing ' Archie ' on the Square. Luke and Graeme . . . what a double act.